If you have a septic system connected to your home, there could be a variety of issues ailing your tank if you’re having issues. By having routine septic tank inspections done, you can typically avoid repairs altogether. However, from time to time, there might be issues that require repairs to be done. Let’s take a look at some of the more common septic tank repairs you’ll have to make. Your septic system utilizes a system of pipes to carrying household waste from inside your home out into your septic tank. Just like normal plumbing pipes, these pipes can break down over time and crack for any number of reasons. At times, tree roots can cause them to break. The material used to build the pipes can also break down. Whatever the case, you should have broken septic tank pipes fixed as soon as possible. If you don’t, they can lead to major problems down the line. 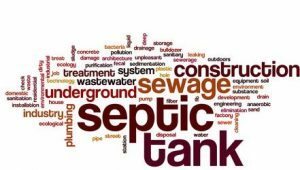 Your septic tank relies on bacteria located inside of aerobic septic treatment units to break down the waste that you put into your septic system. These bacteria will usually last for a long time, but if you don’t use the bacteria for a while, they can die and create a lack of bacteria in your septic tank. When this happens, your waste won’t break down as quickly as it usually does. So by replacing your bacteria, you can get your septic system up and running like normal again. Your septic system uses a drain field at the end of the process to filter all of the water that comes out of your septic tank. But this drain field is not going to last you forever. At some point, you will need to have it replaced because it will stop filtering your water the way it’s supposed to, and often times, that water will rise to the surface and flood your property. Grease and waste can also leak into your drain field if you don’t have your septic tank pumped on a regular basis, which can obviously reduce the lifespan of your drain field as a whole. Are you experiencing a problem with your drain field, or do you want to try to avoid running into the problems listed here in the future? Carolina Septic Pro can help! We offer a range of septic services and can provide you with the septic tank repair if you need it. Call us at 704-626-6622 today to set up an appointment with one of our septic professionals.